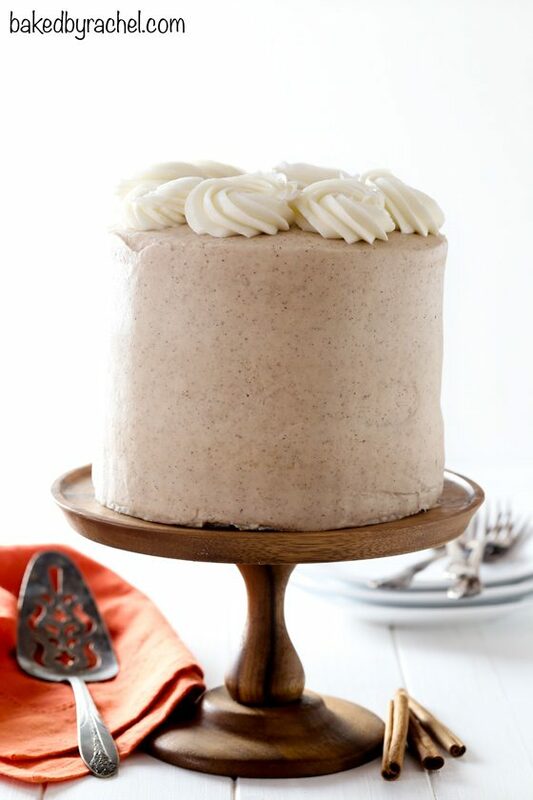 Moist spiced pumpkin layer cake with cinnamon brown sugar cream cheese frosting. A festive dessert, perfect for Thanksgiving or any Fall occasion! Fall in New England… gorgeous and completely unpredictable. I feel like I talk about the weather a lot, and I’m sure I do… but for good reason. Our weather is kind of crazy. In just a few days, we often have crazy fluctuations in temperatures. It’s super common too. I’m always for the warm spells but the deep chills after a warm spell feel even cooler than if it had been a gradual change. 70’s down to the 30s overnight. Brrr. And now the cold temps are here to stay. I’m trying not to complain too much because I love being able to bundle up… Cozy clothes, blankets, fires, warm drinks – all good things. It just feels so much colder than usual this time of year, but I could be wrong. I do hope this isn’t a sign of things to come though. Colder than normal temps. Yikes! I always wait to truly start celebrating Christmas until after Thanksgiving. In my book, it’s always one holiday at a time. But this year, I decided to cheat. I’m slowly putting a few things out at a time. That way it’s less stressful. Spread it out over a few weeks instead of all on one day. Hopefully it will cut down on the frustrations. We’ll see though! I’m still debating on when to put my reindeer antlers on the car. Yep… I’m totally going there this year. Have you caught any amazing deals lately? I splurged on a new pair of LLBean boots over the weekend. 25% off was hard to pass up! This will be my first pair, but I figure the worst that’ll happen is I don’t like them and have to pay for return shipping. Which honestly, that kind of kills me. I hate paying for shipping – huge pet peeve of mine. I’m spoiled by Amazon Prime…even though I do technically pay for the service. Out of sight out of mind though, right? I’ll be getting plenty of use out of that subscription now that the holiday season is here. I try to get in store shopping done and out of the way before Thanksgiving. After that, most is done online. I want nothing to do with stores and crowds. I avoid it at all costs. It honestly amazes me that some people love the crowds and thrill of shopping while it’s busy – trying to find a bargain you can maybe only get in store. Let’s talk about this cake. You need a super delicious dessert for Thanksgiving, right?! 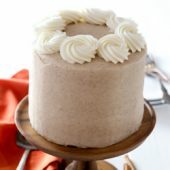 Change up your dessert plans this year and add a super flavorful and moist cake to your sweets table! 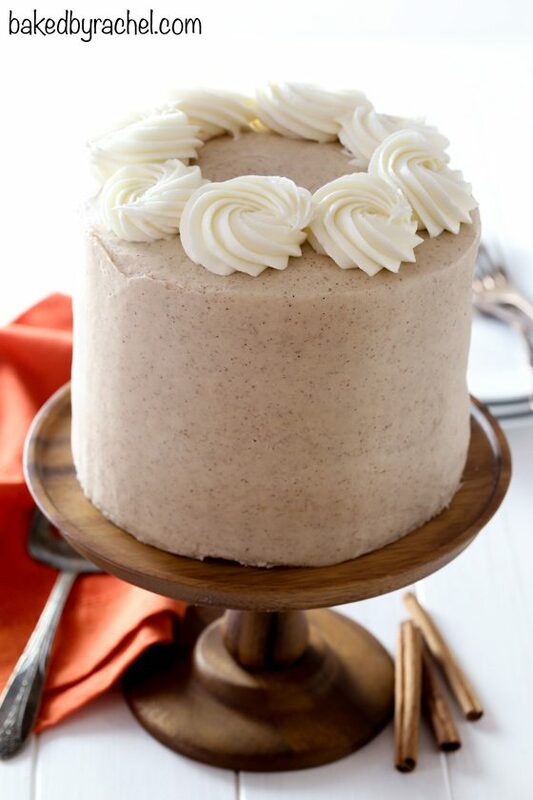 Moist spiced pumpkin layer cake, topped off with cinnamon brown sugar cream cheese frosting! This is by far one of my favorite frostings. It’s so good you’ll want to sneak spoonfuls of it when no one is looking! This cake is packed full of flavor. Perfectly spiced. Creamy. Luscious. Moist. Just flat out amazing and hands down a must make before the season is over! 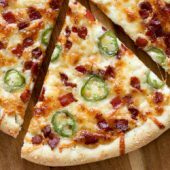 This is a guaranteed family favorite! Everyone will be asking for more! 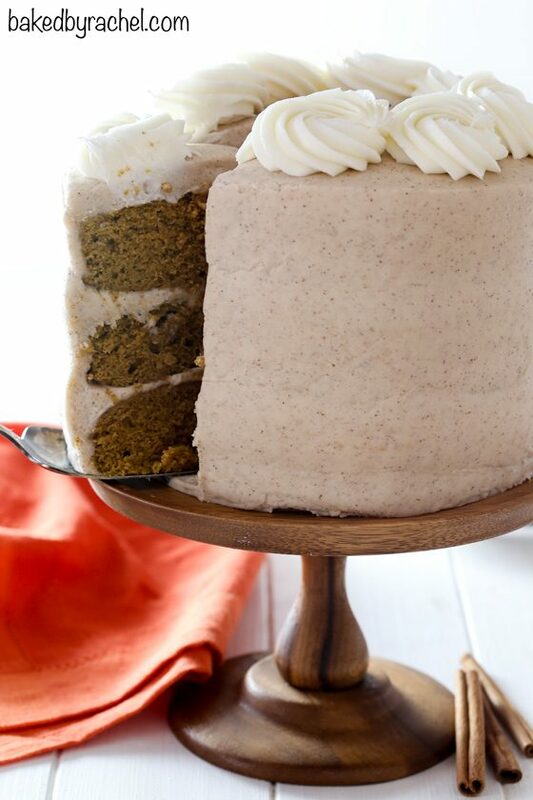 Add this pumpkin layer cake with cream cheese frosting to your holiday baking plans! Preheat oven to 350°F degrees. Prepare three 6-inch round baking pans. Grease the bottom and sides of each pan with baking spray. Line the bottom with parchment paper for easy removal. Set aside. In the bowl of a stand mixer, with paddle attachment, cream together butter and sugars until light and fluffy. Mix in eggs, one at a time, followed by vanilla. Scrape bowl as needed. Mix in spices, salt, baking powder and baking soda. Add half of the pumpkin puree, followed by half of the flour. 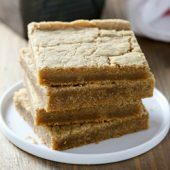 Repeat with remaining pumpkin puree and flour. Mix until just combined and no streaks remain. Divide batter equally between prepared baking pans. Use a small offset spatula to level off the batter in each pan. Bake at 350°F for 25-30 minutes or until a toothpick inserted comes out clean. Cool in pan until completely cool. When cakes are completely cool, remove from pans. Wrap well in plastic wrap. Chill overnight. If desired, use a serrated knife to remove domes from the top of each cake. Discard or save for another use. Return to fridge until ready to frost. Prepare frosting in the bowl of a stand mixer, using the paddle attachment. Beat together softened cream cheese and butter until light and fluffy. Mix in vanilla. Scrape bowl as needed. Add one cup of powdered sugar at a time, mixing well between additions. Transfer 1 cup of plain frosting to a clean bowl. Set aside. Add cinnamon and brown sugar to the larger portion of frosting. Mix until just combined. Place one layer of cake on a turn-table or cake stand. Add 3 large cookie scoops worth of cinnamon frosting to the top. Spread into an even layer. Add a second layer of cake, top off with frosting and spread into an even layer. Top off with final layer of cake. 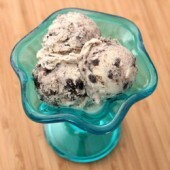 Add 4-5 scoops worth of frosting, spreading into a thin and even coat over the entire cake. Fill in any gaps between layers along the way. This will act as a crumb coat. Transfer crumb coated cake to the fridge to chill for at least one hour. Cover remaining frosting with plastic wrap until ready to use. When your cake has chilled for at least an hour, continue frosting. 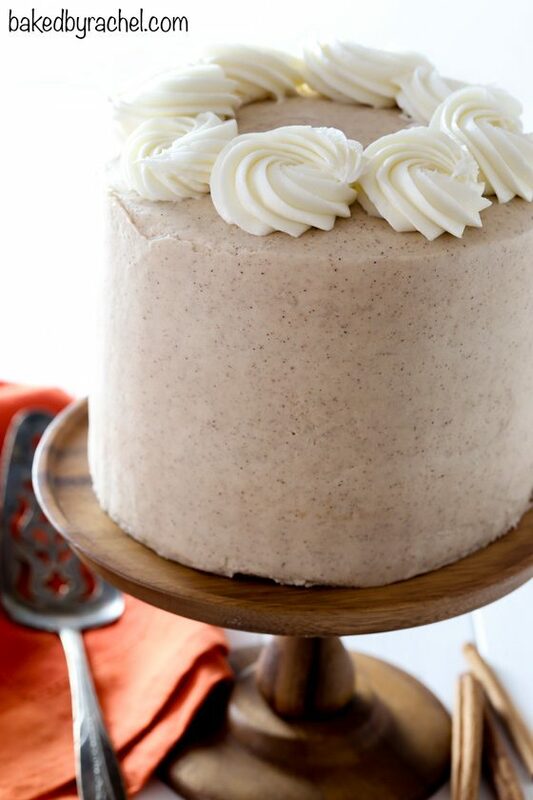 Add a generous amount of frosting to the top of your cake. Work the frosting out and down the sides using a small offset spatula. Smooth tops and sides using a bench scraper and small offset spatula. When completely coated and smooth, transfer cake back to the fridge for an additional hour. Lastly, transfer plain frosting to a large piping bag fit with a jumbo closed star tip. Pipe designs along the top edge of the cake. Store in the refrigerator until ready to serve. Can I use this recipe to make a bundt cake? You can certainly try but I don’t have the proper amounts or cook time for you. Could I do this with gluten free flour? I have xanthan gum.